Massive anti-Trump protests are helping Democrats find their spine. In the years to come, we’ll look back on Donald Trump’s terrifying first weeks as president and see that it was either the beginning of the end of American democracy—or the beginning of its resurgence. By the evening of his inauguration, Trump had signed an executive order intended to hobble the Affordable Care Act. In the next few days, he froze new federal hiring and regulations, gave the green light to the Keystone XL and Dakota Access pipelines, prohibited international groups receiving US aid from talking about abortion, and directed multiple federal agencies like the EPA to essentially cease communicating with the public. The president also spent his first week fighting with journalists over the size of the crowd at his inauguration, while his scowling, irascible chief strategist, Steve Bannon, branded the media “the opposition party” and told it to “keep its mouth shut.” Trump then stunned the national-security world by removing the director of national intelligence and the chairman of the Joint Chiefs of Staff from the National Security Council while adding Bannon, a political adviser. On Holocaust Memorial Day, which the administration marked with a press release that didn’t mention Jews or anti-Semitism, Trump signed an executive order banning immigrants and refugees from seven majority-Muslim countries. When the acting attorney general, Sally Yates, declined to defend the ban, saying she was unconvinced of its legality, Trump promptly fired her. So much for the theory that Trump would somehow be improved by the gravity of the job, or the fantasy that he wouldn’t act on his worst campaign promises. Since the election, he’s assembled a cabinet of plutocrats and incompetents, appointing swamp creatures instead of draining the swamp. It should be noted that Trump was quick to make good on his most xenophobic and divisive campaign promises, while ignoring his vow to fight Wall Street and corruption. This blizzard of first moves—the executive orders, appointments, diktats, tweets, and lies—was blinding. It was meant to be. But we cannot afford to be blind. And yet, despite promises to fiercely fight Trump’s nominees and policies, the Democratic opposition seemed blinded in the first few days of his presidency. New York Senator Kirsten Gillibrand distinguished herself by being the only Democrat to vote consistently against all of Trump’s nominees save one (she voted for Nikki Haley for UN ambassador). Even progressive stalwarts like Senators Elizabeth Warren and Sherrod Brown disappointed admirers by voting to confirm the utterly unqualified Ben Carson as secretary of Housing and Urban Development—in both cases, because Carson made private promises to protect a few of the department’s core functions. But Carson should have been rejected by every Democrat, and more than a few Republicans, as absolutely unfit for the job. The soft bigotry of low expectations, applied to Trump, will only normalize him and give him too much credit for appointees who aren’t David Duke. But if congressional Democrats seemed uncertain about how to battle Trump, they were given instruction by their constituents almost immediately. The resistance began the day after the inauguration, when as many as 5 million Americans joined the Women’s March on Washington and the solidarity marches in over 600 other cities. Organized spontaneously through social media, the march’s neophyte white planners teamed with veteran organizers of color and eventually won the sponsorship of established women’s groups like Emily’s List, Planned Parenthood, and NARAL Pro-Choice America. But the big groups took their marching orders from the grassroots, and it paid off. The success of the day’s events was perhaps more surprising than Trump’s radical, rough start. Who knew 5 million Americans would be ready to march on day one? And who knew that once they marched, they’d discover they liked it, and would spontaneously march again in less than a week to protest Trump’s unconstitutional Muslim ban? As news broke about the number of people being detained at airports around the country—Iraqi military interpreters, Syrian refugee families, elderly Iranian grandparents, all of them with legal travel documents—lawyers and protesters surged to those airports. Soon, the politicians followed. Senator Cory Booker headed to Dulles Airport to try to negotiate some legal representation for the detainees, but Customs and Border Protection officials refused to even meet with him. Senate minority leader Chuck Schumer held a press conference with the family members of detainees, at which he broke into tears (drawing Trump’s mockery the next day). 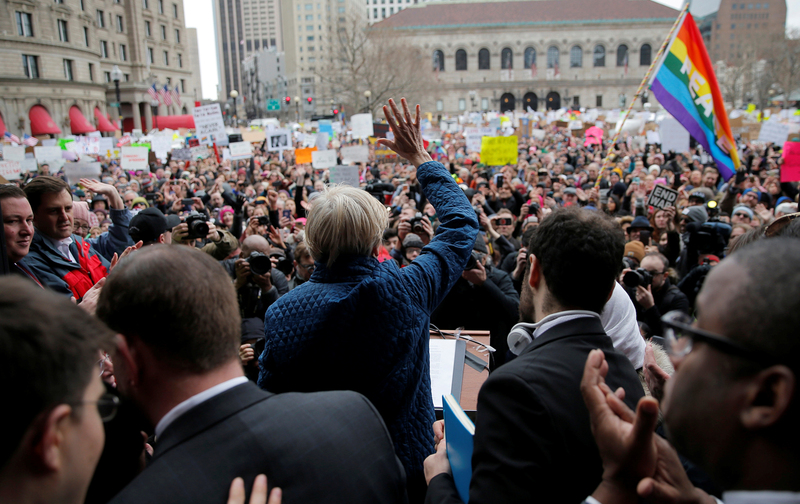 And Warren rushed to Logan Airport, where, over an Occupy-style human microphone, she decried the ban as illegal and unconstitutional. That Sunday, I joined 10,000 other New Yorkers for a hastily called protest at Battery Park organized by Make the Road New York and other grassroots groups. Booker, Schumer, Gillibrand, and other politicians came along too. Schumer even led us in a chant of “The people, united, will never be defeated.” That was great. But also great was the fact that people shouted at him to do more to block Trump’s cabinet nominees. We marched toward Foley Square as the sun set over Ellis Island. It felt scary and exhilarating at the same time: We were in the middle of a constitutional crisis, and we were in the middle of an uprising against the regime that created it. Now what? Just as they did at the airports, the people are leading the politicians, and here’s hoping the politicians continue to follow. One test will be the vote to confirm Jeff Sessions, an immigration hawk and supporter of Trump’s Muslim ban, as attorney general. Democrats may not have the votes to stop him, but after Yates’s “Monday Night Massacre” firing, the stakes couldn’t be higher. How hard the Democrats fight Sessions will be a harbinger of battles to come, including over Trump’s Supreme Court pick (scheduled to be announced as this magazine goes to press). Expect massive grassroots pressure to block the nomination by any means necessary. That kind of pressure works: North Dakota Senator Heidi Heitkamp, who is up for reelection next year, had been expected to support Trump’s nominees, given his popularity in her state. But Heitkamp announced on January 30 that she will oppose the confirmation of public-schools privatizer Betsy DeVos as education secretary, noting that 95 percent of the 1,400 North Dakotans who called her office on the issue asked her to vote against DeVos. Meanwhile, everyone’s getting the marching spirit. Scientists are planning a March for Science. There will be a Tax Day March on April 15 to demand that Trump release his taxes. Washington’s Pride weekend in June will now feature a massive anti-Trump rally. Of course, marching alone isn’t enough. But in the same way that a long walk can help clear the mind from the effects of Trump’s shock-and-awe campaign, marching is awakening people to their own power. These uprisings make it clear that the American people are ready to fight Trump now—not wait until the elections in 2018 or 2020. How this street energy will meet up with campaign politics and create enduring power is still an open question. But for now, it’s a good problem to have.